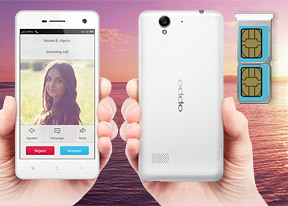 The Oppo R819 is a dual-SIM phone. There are two call buttons labeled SIM1 and SIM2, which can be renamed. You can also choose which SIM gets priority for calls and which is used for data connectivity. The phone can also automatically set up call forwarding, in case you get a call on one SIM while talking on the other. Note that only one SIM can be connected to a 3G network. The dialer uses a tabbed interface, not unlike the stock app. The first tab is the dialer, then there's the contact list, favorites and groups. The phone app does smart dial, but only matches the phone numbers and not the contact's names, which is the less useful option. The button at the bottom left lets you quickly save the number you've typed in to a new or existing contact. In the call settings you can tweak a number of things. One is Notify on connect - the phone can vibrate or ring (or both) when a call connects. You can also build a list of texts to send when you reject a call. The Oppo R819 has a couple of useful gestures too - flip to mute and auto answer (which answers an incoming call when you lift the handset up). This same gesture can be used to automatically turn off the loudspeaker during a call. The R819 will also vibrate when you pick it up and there are missed notifications. Overall, there are more than a few features nicked from TouchWiz. The loudspeaker of the Oppo R819 scored a Average mark - it's far from the loudest phoen around, but at least the vibration is good. You can read more about the loudspeaker test here. The phonebook itself is pretty standard, save for the custom skin. It shows an alphabetized list of visible contacts with an alphabet index on the right if you want to jump to a specific letter (regular search is available too). Contact info is displayed as a list of all available details. A star next to the contact's photo and name can be used to mark them as favorite and there are call and text shortcuts at the bottom. Custom ringtones can be selected for each contact and duplicate contacts can be merged into a single entry. Earlier, we said visible contacts because you can hide contacts with no phone numbers or contacts from specific groups (e.g. ones that were synced from a specific email service). The messaging department is pretty standard - there's a list of all conversations organized into threads, with two buttons at the bottom (Search and Compose). There's a small number next to the textbox signifying the SIM card to be used. You can tap it to toggle the other SIM. Each conversation consists of messages displayed in speech bubbles, similar to a chat program. It's a bit annoying that the compose box starts off as a single line, but it will grow to up to twelve as you type in more text. A character/message counter shows up when you're 10 letters away from the 160 limit. Individual messages can be locked to prevent accidental deletion. Delivery reports can be activated and you can backup and import messages. Scheduled messages are also an option - you enter the recipient, message text and pick a date in the future. Messages can even be sent daily or only on select days (good if you need to message an automated service every day, e.g. to park your car). You can also backup and restore messages to files, so you don't lose them. The Gmail client has the trademark conversation style view and can manage multiple Gmail accounts. Batch operations are supported too, in case you need to handle email messages in bulk. A cool feature in Gmail is that you can swipe left or right to move between messages in your inbox. There is also a generic email app for all your other email accounts and it can handle multiple POP or IMAP inboxes. You have access to the messages in the original folders that are created online, side by side with the standard local ones such as inbox, drafts and sent items. A great option if you're being spammed is Delete all emails from sender. Unlike its Gmail counterpart, this app supports a combined inbox view, with each message color coded according to the account it came from. Hangouts and Google+ Messenger are available out of the box for text and video chatting over the Internet. The big 4.7" screen offers a big on-screen keyboard and there's still enough left over for the app. Keys on the keyboard get even bigger when you switch to landscape mode - the wide screen is remarkably comfortable for two-thumb typing. You can customize the font size for the keyboard for both portrait and landscape mode so you can tweak the size of the keyboard. Also, you can choose if the keyboard goes fullscreen when entering text or if it just overlays the app (again, there are separate settings for landscape and portrait modes). Another option is a Swipe-like mode - you just slide your finger over the keys rather than tap them individually. You can also use offline voice typing as an alternative too, one of the perks of using Jelly Bean. The keyboard can learn new words and if you've built up a dictionary of them you can back it up and restore it later. Other tweaks include sound and vibrate on press. The keyboard also offers a long list of predefined smilies and other characters (hearts, music notes, card suites, etc.) and you can even switch between different styles of smilies - :), :-), :^), :o). And if you really want the world to know you're under 12 years old, you can enable the so-called Fantasy text mode. It's actually an automatic leet text translation with tons of custom "fonts", which gives results like this: 7HI5 I5 N07 4 600D ID34. Plenty of options, including smiley styles and "fantasy text"
If you've recognized these features, you'll know that this is in fact just Go Keyboard, which you can download from the Play Store. Honestly, we prefer to install the Google Keyboard.